I think I may have a gambling problem. No, not the traditional casino poker, blackjack type of gambling. Not the Powerball ticket that I buy even though I have taught statistics and know that my chances are slim to none. No, my gambling has to do with the weather. Three weeks ago the sun was shining, the sky was blue, the temperatures for several days had been warm, and that little patch of earth in my backyard was calling my name. I know, after many years of gardening, that one should never plant before Memorial Day or, as the seed packages all state, “after last danger of frost.” But it was so beautiful out and our growing season in New England is so darn short. And, isn’t our globe warming? To plant or not to plant: That is the question. I planted. I gambled with Mother Nature and put my herbs into the nicely turned earth. I did run out of time that day and never did get the zucchini, eggplant, or tomatoes into the ground. Probably a fortuitous turn of events. The next Sunday morning, I went out walking with my friend Sheila. It was sort of humid in the cool morning air, but definitely comfortable. When we had finished our hour-long trek, I headed home. After lunch – not 45 minutes later — Joel and I went outside to do some yard work. Lo and behold, the day had turned nasty. The temperature had dropped about fifteen degrees, the wind was howling, and rain bordering on hail was pelting us in the face. Mother Nature had decided to punish her rebellious child. I groaned. What had I done to my garden? Surprisingly, the herbs withstood the onslaught and are still standing. But, for the other vegetables, I will wait until Memorial Day to plant the veggies. One glorious spring morning a few years ago, I went out for my morning walk through the neighborhood. On the particular route that day I passed the little brook that feeds into Indian Lake. I glanced down to see a cheerful group of bright yellow daffodils growing on the steep banks of the stream. And, lo and behold, growing between the rocks in the streambed itself were bright red tulips! The water, swelled by spring run-off, was swirling all around the bobbing crimson heads. How did the tulip bulbs get into the brook in the first place? Did they self-propagate, or did somebody throw them away? More important, how could they possibly grow in the water like that? I must take a picture of this, I thought, since nobody will believe it’s possible for flowers to grow in the water like that. I completed my walk, but as soon as I reached home I told my family, “I have to go back and take a picture. You’re not going to believe what I saw. Do you want to come with me? We’ll be back in 20 minutes.” I was babbling as much as that brook. I bent over to grab the camera from its shelf below the television, and a terrific pain shot up my spine. I lay down on the floor and didn’t move. Six weeks later, I had recovered to the point at which I could walk. Of course, by that time the tulips were long gone and I was distraught to have missed the chance to record that once-in-a-lifetime picture. And it was indeed a one-time-only event. I have gone past that brook umpteen times every spring over the past dozen years, never to see the phenomenon again. With apologies to William Wordsworth I think I was meant not to photograph the phenomenon, just to keep it in my mind’s eye forever. Perhaps it was God’s way of telling me to live in the moment. The first few years after we moved into our house, I would develop a strange craving every spring for cottage cheese that coincided with the first mowing of the lawn. It took a while for me to realize that it was the chives growing outside that I was smelling. Somebody living in our home decades ago must have had the great idea that a pot of chives would be a fine addition to the garden. Unfortunately, the darn things propagate like rabbits, so every spring I spend an inordinate amount of time removing them. Which brings me to why I was out in the backyard last Sunday. Preparing the vegetable garden bed for planting requires pulling not just weeds, but the thousands of chives. While engaged in the solitary task, a beautiful birdcall caught my attention. “Chhirr, chiirrr, ba da, ba da, ba da” (at least that’s as close as I can come to translating bird). I looked around, trying to find the source of the song. And there it was. Perched on a branch of the tree on the other side of the garden wall was a magnificent crimson cardinal. 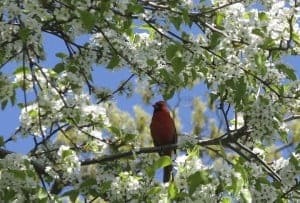 What made it so special is that the Bradford Pear was in full spring bloom, its snowy white blossoms standing in stark contrast to the bird’s vibrant coloring. Most photographs of cardinals that I see feature snow covered pine boughs, and are usually associated with Christmas cards. It was refreshing to see this bright representative of spring, especially after the long and arduous winter we had just endured. (Worcester earned the dubious distinction of being the snowiest city in the U.S. this winter.) 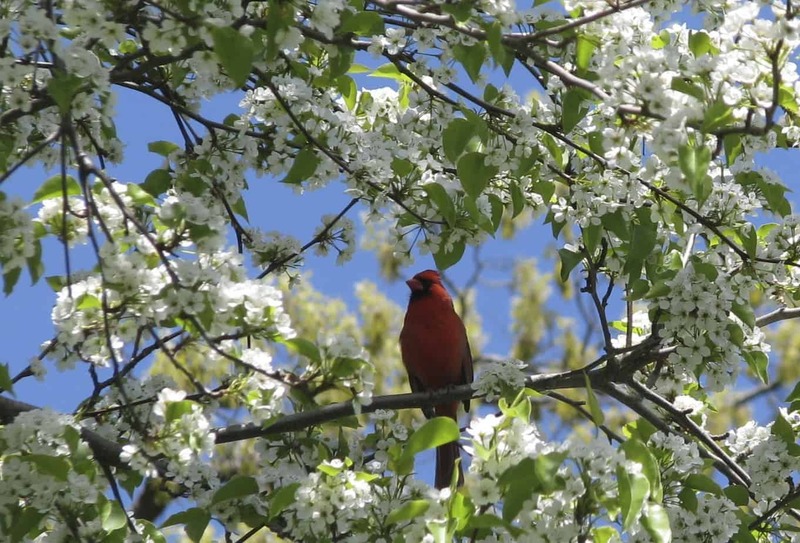 Blue skies, green foliage, and flowers and birds of every hue are most welcome. This year’s resolution: Must get outside more to enjoy both the warming weather and the therapeutic benefits of gardening.